I can't believe that this day has come! 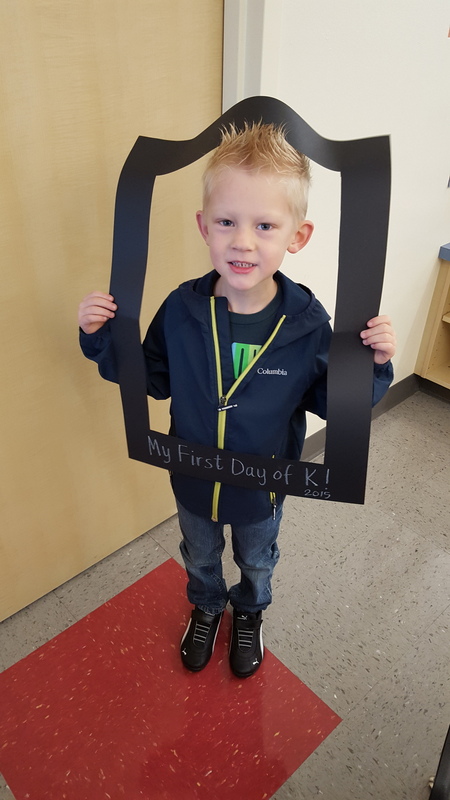 Benton just went to his very first day of Kindergarten. It's big this year because for the first time the state of Oregon went to full day kindergarten. He was really excited about going! Though he wasn't so excited about not getting to ride the bus (nor was I to be honest). He loved picking out his new backpack, lunch bag, and new school clothes. It's been an exciting time at our house. 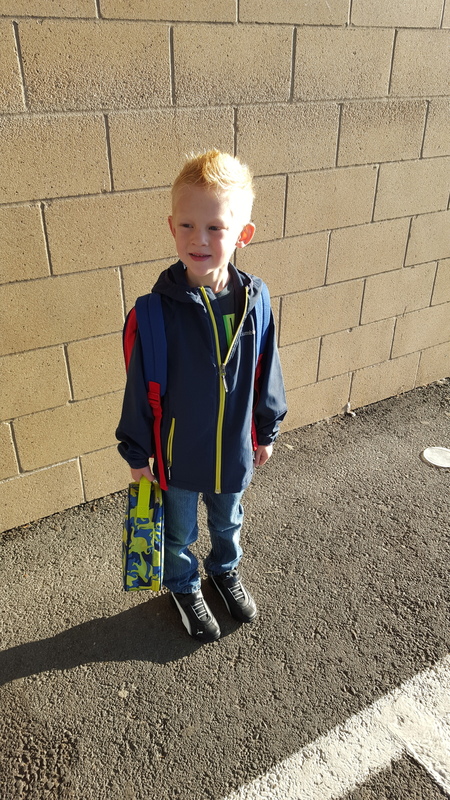 I was able to take him to school for the first day, Dallin stayed home with the 2 littles. Here he is just about to go in! We came and met his teacher 2 days before and he was able to see his classroom then too. He felt pretty comfortable going in this morning. Benton is usually pretty comfortable though, which is great. The teacher made this frame for the kids to hold and have their picture taken, he thought it was great. After figuring out where to put his backpack and lunch bag Benton was free to pick a station. 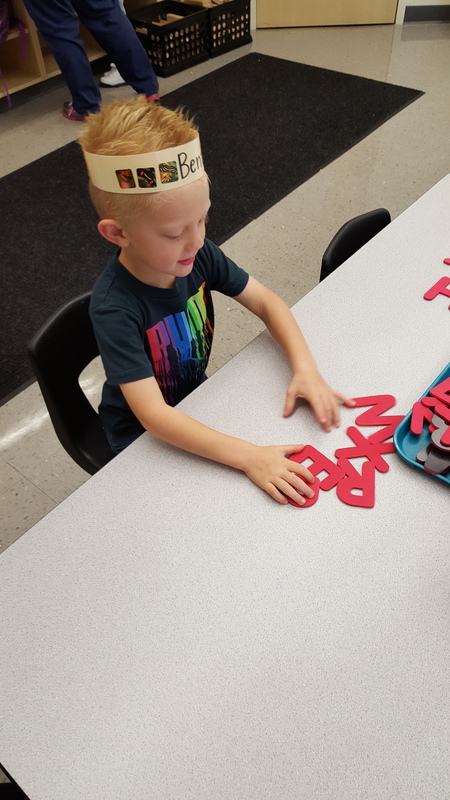 He chose the letters and started laying them out. Before I knew it, it was time for me to go. I gave him a hug and he was on his own. I didn't cry when I left the room, I cried two days earlier. When we went and met with his teacher for a little one on one it was surprisingly hard for me. We walked in the classroom and immediately a complete stranger took the lead in my child's life and started correcting his behavior and telling him of her expectations. At the time it was really hard, but after thinking about it it makes complete sense. She wasn't over the top, she was just setting the expectation level for her class. I've heard that she isn't warm and fuzzy, but that she is really great. Benton does very well when he has clear lines of what he can do and what isn't okay. He soars with consistency, which is something that I struggle with. I do the best I can for my kids sake. But Mrs. Winters is very consistent. It was hard that morning visit (it didn't help that Adalyn and Emmett both decided to throw massive fits and not listen, which I am happy to say is most often not the case), but after thinking about it for a day I realized that he is really lucky to start school with a teacher like Mrs. Winters. She will be so awesome for him. Over the course of his schooling he will have to learn how to work with all different kinds of teachers, but I'm grateful that his first one has high expectations AND offers all the help they need to reach those expectations. He came home from school happy as can be. I've heard of kids coming home tired and worn out. Not Benton. He went on to ride bikes and play outside, then he went to play soccer for an hour before getting to bed. Benton has always been the kind of kid that goes and goes, and he is living up to that now. I'm excited to see how school goes for him as he gets used to going every day.